↑ Sargis, Joe (19 January 1972). "After Eight Seasons .Ray Willsey Quits Cal; White Considers 2 Jobs .". Ellensburg Daily Record. Retrieved 22 December 2009. ↑ Boyles, Bob; Paul Guido (2008). "California". The USA Today College Football Encyclopedia: A Comprehensive Modern Reference to America's Most Colorful Sport, 1953-Present. Skyhorse Publishing Inc. ISBN 1-60239-331-1. 1 2 3 4 5 6 7 Weyler, John (4 December 1993). "Willsey Traces His Roots of Success to Old Coach". Los Angeles Times. Retrieved 22 December 2009. 1 2 "Ray Willsey to Receive Glenn Seaborg Award". CalBears.com. 27 September 2002. Retrieved 2 February 2014. 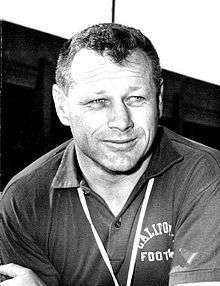 ↑ "Ray Willsey, Cal football coach in the 1960s, dies at 85". The Los Angeles Times. November 11, 2013. ↑ "Ray Willsey Record, Statistics, and Category Ranks". Pro-Football-Reference.com. Retrieved February 2, 2014. ↑ White, Lonnie (17 March 1988). "Ray Willsey Will Coach L.A.'s Cobras". Los Angeles Times. Retrieved 22 December 2009. ↑ Newswire (10 January 1992). "Names in the News". Los Angeles Times. Retrieved 22 December 2009. ↑ Davidson, Mike (22 June 1996). "Keller spreads gridiron gospel". Daily Herald. Retrieved 22 December 2009. ↑ "NFL Europa history". NFL. Retrieved 22 December 2009. ↑ Bush, David (25 December 2004). "'Bear Minimum' was one tough act". San Francisco Chronicle. Retrieved 22 December 2009. ↑ Faraudo, Jeff (November 6, 2013). "Former Cal coach Willsey dies at 85". Retrieved November 6, 2013.